This entry was posted on September 24, 2011 at 3:28 pm and is filed under Paladinning Info, World of Logs. You can subscribe via RSS 2.0 feed to this post's comments. Are those logs from Tuesday? hehe. I find that my healing is never what I want it to be, especially on Majordomo Staghelm. I’ve looked these over, and unfortunately I’ve tried them all (besides the spell order), but to no avail. Oh well, I usually do better on other fights. I don’t like Recount and/or Skada as gages of performances because they’re not very accurate and don’t show much information. Like I wrote in the introduction, a small difference in output isn’t a big deal. It’s class/assignment/mechanics dependent. Aiming to actually top healing meters, should only be ever in jest. When actually playing, your goal is to do your job. Your second goal is to help your teammates do their job. If you’ve got both goals down, then your spot on the meters will be nothing to worry about. 1) Grid, because I’m used to it. 2) Vuhdo, because it replaces around a dozen addons and Grid plugins. 4) Healium if nothing else works, but its interface is not friendly to the notion of saving space. It was a greaaaat series though, and I thought it deserves way more attention than it got. I think some people can heal with general frames, but I would certainly recommend healer-centric frames above all others. I used to be a big Grid fan, but I gave Vudho and Healbot a test drive (in hopes of writing a comparison post too) and they were all very similar. So now I just suggest to use whatever you feel more comfortable with or, if you’re completely new to frames, go with what your friends use because it’s easier to get help. I started with Healbot during BC and moved to Vuhdo in Ulduar for some particular features. I never did try Grid, only because the plugin management seemed overly complicated and Vuhdo was already doing the job in a self-contained fashion. Healbot was already pretty sharp when I left it. All three of these options are strong, though there might be some minor differences in features which suit someone better. I have respect for anyone creating, publishing, and supporting an addon. I 100% disagree with the design choices made. Maybe (but not really) this is usable for a 5-man setting. Yeah, Healium doesn’t seem to be focused on raids, at least not for healers that might have over a half dozen binds per frame. And yes I could see it working in 5-mans, but I could see Clique working better. I’ve always been told that you need plug ins for Grid too, but other than Clique (which isn’t really a plug in), the only plugin I’ve ever had to use was the Chimearon one. Everything else – spell/buff/debuff/aggro/mana tracking and timing – I’ve been able to do without plugs in. So I’ve never understood why everyone claims you need plugs in to make it work. “Need” is a strong word, though once you get used to having certain Grid plugins, it’s hard to do without. For example, being able to track where your Frisbee is (and how many charges it has, or who has the Weakened Soul debuff (and who doesn’t) is pretty darned handy when you’re a disco priest. Likewise, if you can see who has dispellable debuffs quickly, you can totally discard Decursive or other similar (now redundant) addons. 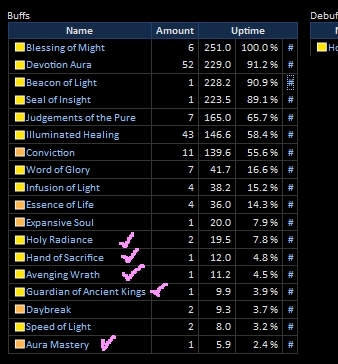 A plugin to see everyone’s mana levels is useful for knowing when to blow innervate / hymn / etc. A half dozen or so plugins will eliminate the need for several addons – and possibly raid frames – completely. I can see stacks and debuffs (any debuff, dispellable or not) without plugins. Not sure about mana bars – I don’t use them because I find them distracting – but I think you can config Grid to show them without having to add plugins. Have you considered two healing Rag? It considerably shortens phase three, you get fewer meteors, and more time up on rag because the lava scions die much faster. I actually did suggest it, but my guild is really cautious about trying to two heal things. I do think it would be good for us on Rags in his current state since, despite what the heal meter snapshots looked like, healing wasn’t a problem. I think this is a really great post and that a lot of your tips or observations could easily apply to other classes or specs, who may be thinking or going through the same things. It’s great to see another post from you, dear. Thanks 🙂 Been sitting on this one for a long time. I do miss blogging, there are just not enough hours in the day for it! After nerfs we found ourselves wishing we’d had a healer bring a viable offspec, mostly in our 10 man alt raid, but also for a fight or two in our new heroic 25 progression last week where I have already asked and been given permission to dps some this week. Yay! IMO you hit the nail on the head with making frequent use of cooldowns, something I often overlooked when I first began pally healing. Also there are a few encounters in current tier that call for glyph swapping for efficiency, and that also spices things up a bit. Always what I have loved most about holy pal, seems so much more versatile and adaptable. I’ve really come to enjoy piddling through our raid logs lately also. Great way to learn a little more even about your strengths and weaknesses. Well, if you’re waaaay behind everyone else in terms of numbers, it has to be looked into. Everyone should be pulling their weight. But small difference are normal and then it’s more about keeping people alive than anything else. Oh definitely. Being way behind, and just being .5- 2% are two different scenarios. But for example Baleroc fight I am way ahead hps because I can really increae my hps with help of DF coupled with HS and WoG. Doesn’t mean our other healers aren’t pulling their weight, it’s just a HPally style of fight. On Rags, since esp phase 2 and 3 have tons of raid AoE damage, I am usually number 2 or 3 in ranked healing done. Right now unless there appears to be a problem, I don’t even bother looking at meters. Of course, like I said, you should look at the big picture..
And when you’re running with the same people, you know who pulls their weight and who doesn’t. I look more closely when we have new people, and new healers or new guild members also tend to look more closely at their numbers too, to make sure they’re living up to expectations. good stuff, will be posting this to my guild’s holy pallies, as many of them are new to researching on worldoflogs how to do things. Wonderful write-up. This may be one of the clearest paladin healing guides I’ve seen, and not just from a post-bad-healing situation. In fact, other than spell name changes, I think this is a fantastic guide for basically every healer (minus the beacon section, I suppose – hurray unique abilities!). I’ve only done a modicum of pally healing at 85, but having healed all of Wrath on my druid, I can say that each piece of this is really applicable to all healers. Once again, great write up – a fantastic post to drop in with! I’m not familiar with other healing classes, so I kept this from a pally point of view. According to the healing roundtable we did (which isn’t up yet) holy priests don’t cast all the time, but everyone else does. But I guess casting, proper spell and cooldown usage while using some decent raid frames are the foundations of healing. 1) what do you use for tracking all this info? I’ve never been in a situation where my performance is under review (I’m in a decent ten man team where all the members pull their weight just fine but I’d still like to see my own performance and try to improve). Is this just world of logs? 1) All of those screenshots are from World of Logs, particularly the spells cast and the buffs section. Very helpful for tracking after the fact. Logging yourself is easy to do and their are a lot of resources online. Once you start doing it, I recommend Loggerhead to handle auto-on/off of combat logging in the game. 2) All spells that transfer through Beacon will transfer overheal as well. The change was to buff WoG, making WoG generally better unless you Glyph LoD – plus each LoD hit has it’s own chance to crit. 3) An acceptable uptime for Conviction is 90%+. If you’re not moving during the fight (Chimaeron??) then ~100% is the goal. The amount of Crit needed to maintain Conviction with near constant casting is fairly low. On Conviction, you want it up as much as possible. You can use the buff tracking option from WoL to see when it fell off and for how long. I checked my own logs, on non-moving fights, I’m usually around 95-100% uptime. On a moving fight like Rags I’m more around 85%. But yeah, closer to 100% uptime, the better! Thank you for this article. I really want to learn to heal, and your comments seem most helpful. Of course that seems to be your normal. Here is hoping I get the courage to inflict my skills on some poor random group and not let them down too badly. Good look with your healing! I did hope that I got my points across in a way that even non-paladins would understand.